This English-language translation of Mark Hengerer's Kaiser Ferdinand III: 1608–1657 Eine Biographie is based on an analysis of the weekly reports sent by the papal nuncio’s office to the Vatican. These reports give detailed information about the daily whereabouts of the dynasty, courtiers, and foreign visitors, and they contain the gossip of the court in addition to weekly analysis of some political problems. This material enabled the author to report on daily life of the dynasty and to analyze the circumstances under which policy was made, which has led to a balance between the personality of Ferdinand III and the problems with which he dealt. 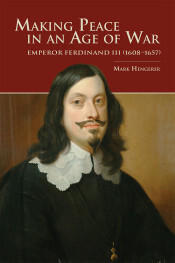 In this biography, Hengerer provides answers to the question: Why did it take the emperor more than ten years to end a devastating war, the traumatizing effects of which on central Europe lasted into the twentieth century, particularly since there was no hope of victory against his foreign adversaries from the very moment he came into power? Mark Hengerer studied history and Latin at the Universities of Münster, Westphalia, where he graduated in 1996, and Vienna, Austria. From 1996 to 2002, he worked at the University of Konstanz in a position that combined teaching, administrative duties, and research for his doctoral thesis: “Kaiserhof und Adel in der Mitte des 17. Jahrhunderts. Eine Kommunikationsgeschichte der Macht in der Vormoderne." As assistant professor, he continued working with Dr. Rudolf Schlögl until 2012. He spent several years in France for the research for his project on French ports in the ancien régime, having received grants from institutions such as the Cluster of Excellence 16 and the German-French program DAAD/FMSH (Paris). In 2013, he was offered the position of professor for early modern history at the University of Munich (LMU).